“SAINT JARLATH. Who’s that?” I asked my Catholic-raised and educated husband as we pulled up to a rural Minnesota cemetery during a recent Sunday afternoon drive. He offered no information, as puzzled as me by the saint behind the name of St. Jarlath’s Catholic Cemetery located just off Waseca County Road 22 in Iosco Township. My later online research revealed Bishop Jarlath as the founder and principle patron of the Archdiocese of Tuam in Galway, Ireland. Irish names in the cemetery should have tipped us off. I delight in discovering such well-kept rural cemeteries edged next to equally well-maintained churches. Clearly, people care deeply about this place. That pleases me although the closure of rural parishes like this one does not. As we wandered the grounds, I spotted autumn décor adorning some gravesites. Seeing scarecrows on a tombstone marked a first for me. and clear markers of faith in crosses high and low. I tugged at the church door, hoping to get inside. I never expect access. But that doesn’t stop me from trying. 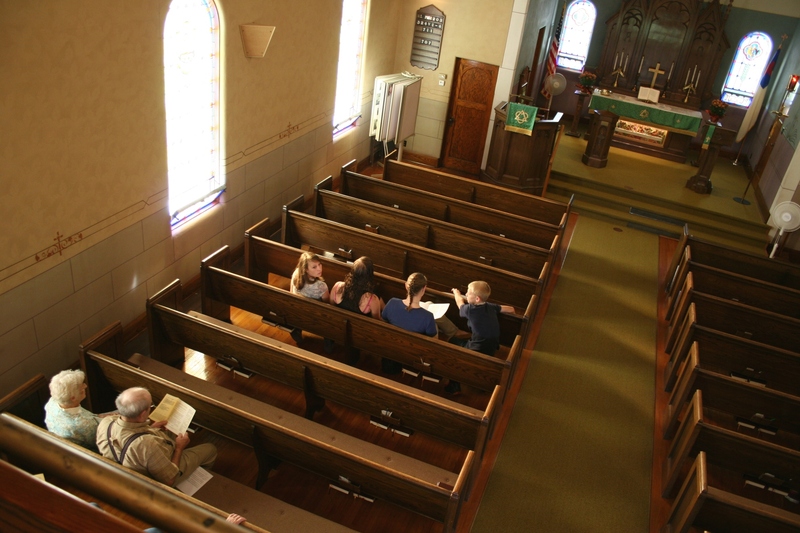 Gone are the days of unattended, open churches. I can only imagine the beauty, the history within this country church. The ability to freely wander this cemetery on a stunning autumn afternoon tempered my disappointment. To see folks honor their ancestors and Saint Jarlath through a well-kept church and grounds encourages me. This place remains important—at least for now to those still living. AS I SCHEDULED this post, written days before the deadly mass shooting at First Baptist Church in Sutherland Springs, Texas, I feel compelled to add this postscript expressing my sorrow and thoughts. I cannot fathom the loss to these families, to this community, about the same size as my Minnesota hometown. My heart breaks. A church, of all places, should be a sanctuary from violence. No place seems safe any more. Initial media reports reveal the perpetrator had a history of domestic violence and that he sent threatening text messages to his mother-in-law shortly before killing 26 people and wounding another 20 at the church. This troubles me. Domestic violence continues to root deep into our society. I read or hear media reports daily about murder-suicides, violations of restraining orders, calls to domestic disturbances, stalking, assaults…and more. For every case reported to law enforcement, many many more are not reported. Because of fear. Because of intimidation. Because of control and manipulation. The invasive crime of domestic abuse and violence is affecting too many of our families, our neighborhoods, our communities and, yes, even our churches, directly and indirectly. At the St. John’s car cruise-in. I’VE ATTENDED CAR SHOWS in parks, along city streets and at a fairgrounds. But never at a church or in the country. A vintage car arrives for the cruise-in car show at St. John’s, 19086 Jacobs Avenue, rural Faribault. A tractor trophy awarded at the show reflects this rural region of southern Minnesota. 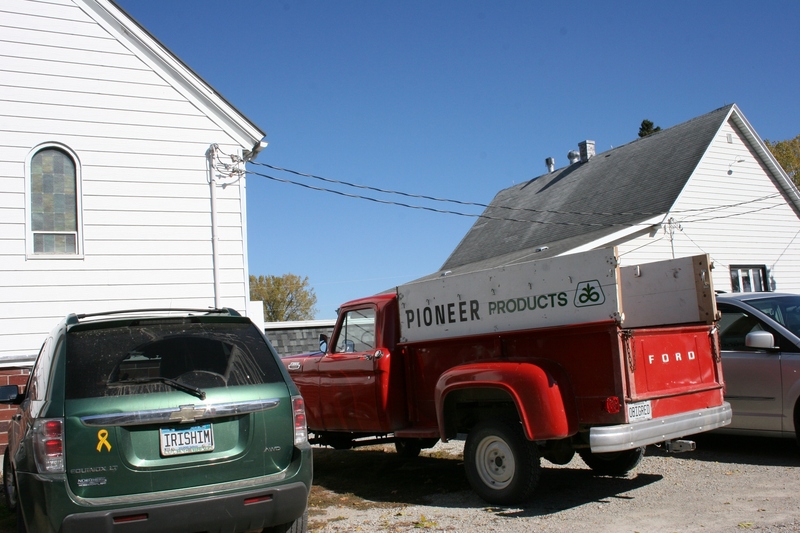 Across the road from St. John’s, a truck pulls a grain bin. Saturday morning I wheeled to a country church northeast of Faribault for St. John’s United Church of Christ, Wheeling Township’s first-ever Cruise-In Car Show. It’s a peaceful rural setting among farm fields and farm sites near Nerstrand Big Woods State Park. An overview of the car show next to the church. 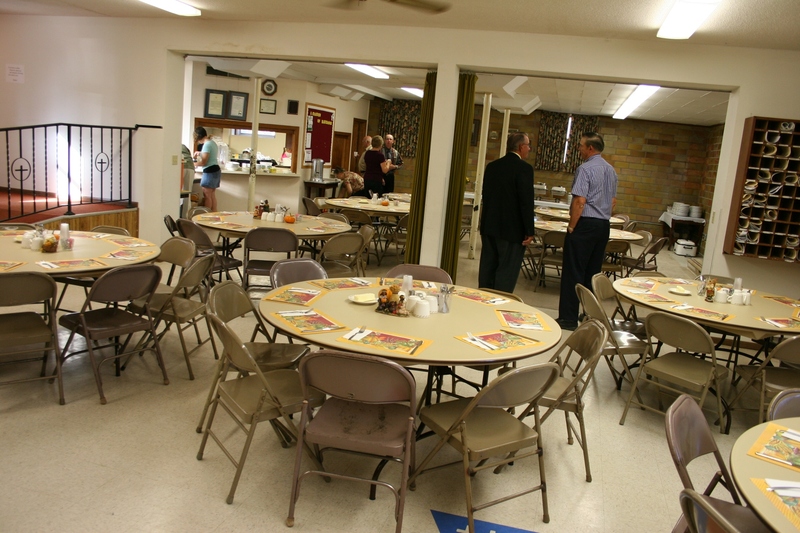 This congregation knows how to draw folks in for events ranging from the annual The Last Supper Drama on Palm Sunday to Lenten soup luncheons to an ice cream social to a September Germanfest to the Big Woods Run and more. Many times I’ve gone to St. John’s activities, where I always feel welcomed by a friendly group of people like 90-year-old historian Elsie, Lynn (who’s usually in the kitchen) and the Rev. Lora Sturm. My husband’s hands clasped in prayer. On this Saturday morning, the reverend leads attendees in prayer. As I stand between a row of vintage cars in the church parking lot, I consider how wonderful to hear this prayer of blessing upon the vehicles and upon those in attendance. This group of men visited for a long time around various vehicles. While visiting with others, I note that most either belong to this congregation or grew up in this church. There’s a special closeness in country churches that comes from living in the same geographical area and gathering here to socialize, to celebrate, to mourn, to grow in the faith (although some admittedly have drifted away). The oldest vehicle at the event. Roots run deep through generations of families. German immigrants founded this congregation in 1856 as Minnesota’s first German Evangelical Church. They worshiped, nonagenarian Elsie tells me, in a log cabin before that burned and the current church was built in 1870 by German farmers from locally-quarried limestone. I set my camera on the grass and aimed up to photograph this view of St. John’s. Yes, there’s a cross-topped steeple, just not in this image. The “Old Stone Church,” as it is known, stands strong on the corner of a paved county and gravel road next to the church cemetery. A 4-year-old boy points to a gravestone and tells me God is buried there. I lead him to the stone, read the name thereon and explain to him that God is not buried here nor is He dead. Cars parked right next to the cemetery. I love that these kids have been together for hours—romping on the mini playground, playing hide-and-seek, searching for a geo-cache stashed in a treeline behind the cemetery… This setting invites such play, reminding me of my own upbringing in a small town Lutheran church. The scene reflected in the shiny bumper of a car. Guys chatted next to tractors. Lovely crabapple trees edge the parking lot. St. John’s members make their famous apple jelly from these apples to sell at Germanfest. On this Saturday, this cruise-in is not just a gathering of car, truck and tractor enthusiasts showing off their vehicles. This event is about memories and socializing, about slowing down and appreciating the beauty and quiet of this reverent country place. It’s about being neighborly. Volunteers served up a generous plate of a BBQ pulled pork sandwich, potato salad and beans, all for $5. And it’s also about the food, this time delicious BBQ pulled pork sandwiches from the Rice County Pork Producers. I always leave St. John’s feeling happy and smiling. St. John’s, from my experience, has always nourished the body, soul and spirit. And on this late July morning, this cruise-in accomplishes that mission in food, setting and friendly conversation. FYI: Check back tomorrow and the day after for more photos from the St. John’s Cruise-In Car Show.